Proposals to introduce a new regulatory body to help bind the Transatlantic Trade and Investment Partnership (TTIP) are likely to bypass national governments by centralising decision-making powers in the hands of Brussels and Washington, policy analysts have told EURACTIV. On Tuesday (10 February), the European Commission published negotiating documents following the close of the eighth round of TTIP negotiations, held in Brussels last week. The round, which focused on regulatory aspects, included detailed provisions for stepping up cooperation within the TTIP by setting up a transatlantic regulatory cooperation body (RCB). The proposed RCB will aim to discuss regulatory proposals relevant to the agreement, covering issues such as textiles, automobile standards and professional qualifications, at an early stage, in order to ensure a coherent approach to rule-making in the US and EU. It will have no power to issue policy, and will only feed into the existing rule-making processes, but is likely to be influential within the relevant regulatory processes. Details on how the RCB would operate remain sketchy. However, it would have different ad hoc configurations depending on regulatory sector, and draw personnel from existing European and member state regulators. EU officials told EURACTIV there were no plans to create a large secretariat or EU agency. Business groups and civil society organisations have disagreed over the efficacy of regulatory cooperation. Improved regulatory convergence and standards compatibility would help increase trade, lower costs, create jobs and improve the international competitiveness of the industry, said Erik Jonnaert, Secretary-General of the European Automobile Manufacturers Association (ACEA) last week in a European Parliament hearing. But NGOs have signed a joint declaration spelling out their “deep concern and firm opposition” to such cooperation, arguing it will drive down standards in areas such as chemicals, food standards and financial services. In a bid to assuage such fears, the EU stated explicitly in its proposal that existing and future regulation and protections will not be restricted by the deal. Rules affecting EU chemicals within REACH will not be affected, and will be kept out of the agreement. The proposals also suggest a yearly review process open to stakeholders. “The intention is that those involved would be drawn from the widest possible range of groups representing civil society, NGO and campaign groups in addition to corporate interests,” said an EU official. Sensitive to this issue, the EU executive said it will table a paper before April dealing with the exchange of “planned or existing regulatory acts of US states, and of the central national authorities of EU member states”, where these impact on the treaty. “The sort of trade agreement that both sides have set out to do will involve some thorny issues about competences – whether about EU constitutional rights or federal US decision-making,” said Fredrik Erixon a Swedish economist and director of the European Centre for International Political Economy (ECIPE). “Neither side wants to go into details about this, because they want to do a free trade agreement and will need to find some ways to centralise powers and trespass on regulatory powers in the member states and federal states,” Erixon added. “It is likely to change the nature of the debate on policy at a discursive level, although it will not change the mechanics of policy-making,” said one senior think tank academic who preferred not to be named. “Europe has lived with split [regulatory] competences on services, intellectual property and a range of other issue now we are taking a giant leap forward in regulatory policies where we need to have restrictions on regulatory bodies and state-controlled regulatory bodies, so we are stepping into a new era,” Erixon added. An EU official dismissed the suggestion that Washington and Brussels would increase their leverage over the regulatory processes as “an interpretation” of the RCB’s intended role. EURACTIV France: Les négociations sur le TTIP reprennent sous tension à Bruxelles? When it comes to TTIP the EU needs to tread very carefully. Across Europe many are already questioning the very legitimacy of the EU to regulate on so many issues – from waste management to food safety standards. Does the EU really want to undermine its credibility further by adding yet another regulatory layer to the hundreds that already exist? The ordinary citizen is not going to like the creation of the RCB. There is a risk that many may come to the conclusion that their views on food, the environment, climate change and consumer products will be but a faint echo emmanating from the bottom of the heap whilst industry interests (particularly those of large US corporations) will ring loud and clear at the top. Regulatory convergence works within the European market because it has institutions in place to enable the free movement of goods and removal of trade barriers (tariffs and hidden), namely the Commission, the Council, the European Parliament and the European Court of Justice. There is a whole body of EU law dedicated to the removal of hidden trade barriers, which in turn gives business the confidence to trade across the single market and consumers confidence that a toy made in Italy is as safe as a toy made and sold in Spain. With many in Europe already beginning to challenge the legitimacy of these institutions can the EU really afford alienating the European population with yet another unaccountable body deciding regulatory issues? 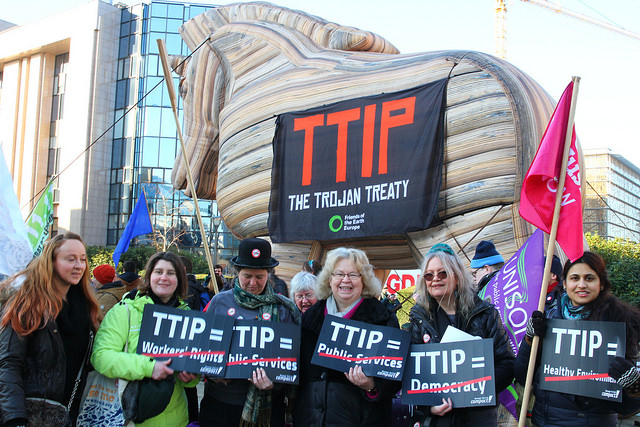 The TTIP is not designed to negotiatie a union between the EU and the US – it is a trade agreement. Trying to impose regulatory convergence between the European market and the US market is widely ambitious, it lacks any form of authority from established institutions, it has no Court to arbiter disputes and it has no mandate from democratic insitutions. Whether true or false the average European will view regulatory convergence and the proposed RCB as a conduit for industry, not consumer, interests. It will give detractors yet another reason to oppose the TTIP. The ‘‘Policy Analyst’ who spoke to Euractiv has it all wrong today in suggesting that TTIP will lead the US and the EU to usurp a government’s power to regulate. TTIP is not about harmonizing political choices. Rather there are areas where the standards and levels of protections in the EU and US are similar, equivalent, or equal, because we share many of the same values, but where the implementation or the manner in which these standards are achieved are different. TTIP is an opportunity to create a framework to reduce or eliminate unnecessary regulatory divergences, without affecting or changing the levels of protection. To do away with duplicative certifications, different licensing procedures and administrative requirements. This will help facilitate business and help smaller businesses which do not currently trade internationally because of burdensome tariffs, regulatory differences, and customs procedures which make international trade too expensive, too administrative and too time consuming. A comprehensive and ambitious TTIP which eliminates tariff barriers, delivers regulatory coherence, and facilitates trade through customs modernization, will enhance a growth-oriented investment climate in Europe and the United States, and will benefit business, employment and all citizens on both sides of the Atlantic.